The affection in which Slade are held by a small but dedicated group of fans has taken tangible form in a new book by two of that number, Ian Edmundson and Chris Selby, whose The Noize: The Slade Discography, a privately produced and funded initiative, is now available on Amazon via print on demand, priced at a little over £20. By combining their Slade knowledge, record collections and cuttings files, the two authors have created an unauthorised but discrete history of the band that is signposted chronologically by their singles and albums, all the way from the first ‘N Betweens single in 1965 through the glory and doldrums years to the most recent solo recording, which just happens to be Jim Lea’s 2018 six-track EP Lost In Space. Well, it’s a good job somebody out there cares. I belong to a school of thought that believes Slade have to a certain extent been unjustly written out of rock history through efforts by music industry bigwigs to disregard their achievements. Part of this is due to snobbery. Provincial to a tee, Slade never played the industry game, never behaved deferentially towards persons of influence, never minded their p’s and q’s in polite company. The situation is not helped by an unimaginative re-issue programme that is unlikely to tempt fans to part with their money and what seems to be an ongoing and rather unseemly disagreement between former members with regard to who contributed the lion’s share of creative effort into their many hits. This latter issue has been bubbling under for a while now, surfacing only occasionally when one of the antagonists feels inclined to speak out, but it never makes headlines because it’s not really news. Furthermore, you don’t need a degree in music business lore to deduce that while the group’s songwriters, Noddy Holder and Jim Lea, have emerged from the Slade saga as men of substance, the two junior partners, Dave Hill and Don Powell, have not been so lucky – the fate of non-writing band members everywhere – otherwise they wouldn’t be obliged to tread the boards as Slade II. This endeavour, tolerated but hardly encouraged by Holder and Lea, has now been put on hold following the snapped tendons in both legs that Powell suffered while changing trains on his way to a gig in Wakefield in the north of England late last year, a cruel turn of fortune for one of the nicest men I know. All of which must distress fans like Ian Edmundson and Chris Selby whose book is a true labour of love that reflects a lifelong devotion to the cause, though they demur at addressing any of the issues that I refer to above. As thorough as it is enjoyable in a nostalgic sense, the 206-page large format book tells Slade’s story from an authoritative perspective that relies on published accounts interspersed with quotes from the band to reinforce this. The record releases are illustrated with hundreds of sleeves, labels and images used to promote them, almost all of which are in colour. More than anything else, turning the pages makes it abundantly clear that Slade were far more prolific than is suggested by their glorious chart run in the first half of the seventies. Particularly interesting for me is the period between that July 1965 ‘N Betweens single and when Chas Chandler ‘discovered’ them around the middle of 1969. Aside from some early efforts by pre-Slade groups, a number of singles were released, as was the rather unfocussed LP Beginnings by Ambrose Slade, every track of which is analysed here. When Ambrose was dropped they were billed as The Slade on Chandler’s first production, ‘Wild Winds Are Blowing’, which coincided with their ill-advised skinhead phase. 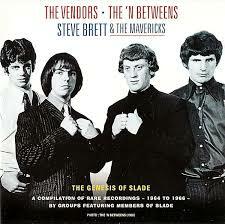 In 1996, Slade fan John Haxby collected 25 even earlier recordings – not unlike the early tracks on The Beatles’ Anthology 1 – by The Vendors (featuring Hill and Powell), Steve Brett & The Mavericks (featuring Holder) and two editions of The ‘N Betweens (the first featuring Slade with John Howells on vocals, the second just the crucial four) on a fascinating CD entitled The Genesis of Slade, and all of these little-known tracks are discussed in The Noize. Even with Chandler at the helm it took a while before Slade’s breakthrough arrived. It finally happened in 1971 with ‘Get Down And Get With It’ (aka ‘Get Down With It’, as labels here indicate) and, not long after, ‘Coz I Luv You’, the first Holder/Lea composition, the first to top the charts and the first to utilise the phonetic spellings that caused such anguish in teachers’ common rooms. By this time I’d become aware of the group and was writing enthusiastic reviews in Melody Maker, largely inspired by the excitement they generated at live shows. “They’re a breath of fresh eayer,” Chandler would yell at me over the din in his slightly threatening Geordie accent. Indeed, here was a group that had honed their craft over hundreds of nights in clubs and pubs up and down the land, an apprenticeship that would ensure their fortunes for as long as they plied their trade. Appropriately, then, it was their 1972 live LP, Slade Alive, that sealed matters, spending 58 weeks on the charts, far and away the longest of any Slade album. Recorded over three nights – October 19, 20 & 21, 1971 – at Command Studios in Piccadilly at a cost of only £600, I was present on the 20th, a Wednesday. Earlier that day, in the late afternoon, Slade had recorded an appearance on Tops Of The Pops, performing ‘Coz I Luv You’. Euphoric at having reached number one for the first time, they arrived at the studio straight from the BBC Centre in Shepherds Bush in a state of high excitement, and it would be an understatement to say that, with Noddy leading the charge, the four boys from the Black Country were at Olympic fitness that night. Five years of hard slog had finally paid dividends and as I watched the “Full poke, Charlie!” show from among an audience of 300 I knew I’d picked a winner. Fittingly, over four pages are devoted to this landmark release and thereafter The Noize details the upcoming glory years with all the LPs, picture sleeves and labels you would expect. Slade had 12 top five singles between 1971 and 1974, including six number ones, and three number one albums, making them the country’s most consistent hit makers in an era when the competition – T. Rex, Bowie, Rod and Elton among them – was at its most intense. Slade’s progress is summarised in text that prefaces each year’s releases, and I was delighted to note that in their review of 1973 – a key Slade year – Edmundson and Selby draw attention to the US group Kiss’ adoption of Slade’s style: “Kiss saw the band in concert in New York and consciously adopted the whole Slade attitude,” they write, “some of the dress sense and to an extent the general sound of Slade on their own recordings.” The authors add that Kiss’ hit ‘Rock And Roll All Nite’ – note the misspelling – even included the lyric, “You drive us wild, we’ll drive you crazy.” Kiss, of course, have been inducted into America’s Rock and Roll Hall of Fame. Why not Slade? In many respects 1973 was an apogee for the group. Though the year ended with their biggest hit, ‘Merry Christmas Everybody’, it was their last number one, and thereafter, gradually, things would calm down for them. Nevertheless, an aspect of Slade’s career that is truly reflected in The Noize is how Slade never gave up trying when the chips were down. They battled fashion, a punk backlash and indifference, enjoyed a brief renaissance in the early eighties and carried on releasing records throughout the decade, and all these later releases on a myriad of Chandler-backed labels are carefully listed and annotated. It seems fitting here to mention for those unaware of it that between 1971 and 1975 I probably wrote more about Slade than any other music writer, and more enthusiastically too. 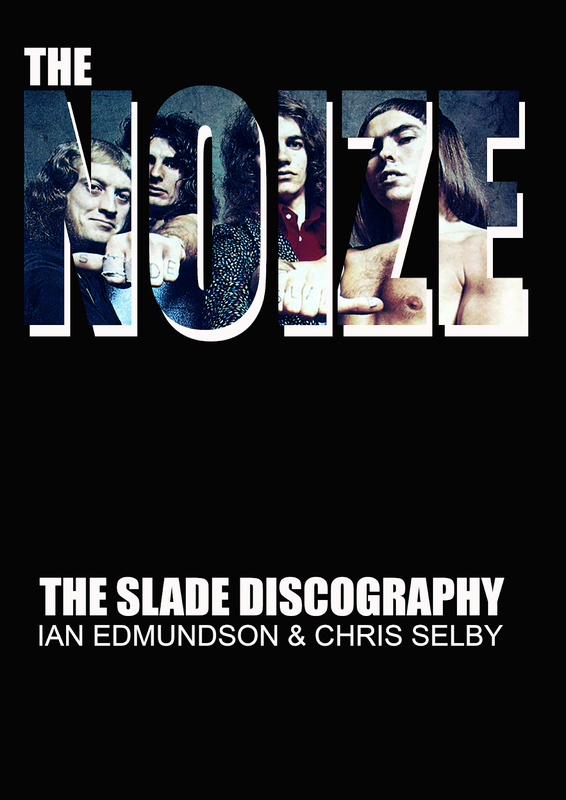 Like the authors of The Noize, my fondness for Slade also never waned and in 1983 I was commissioned by Omnibus Press to write a book about them. 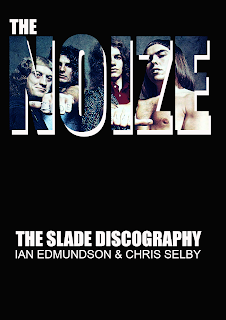 I approached Chas Chandler who, in exchange for copyright control, agreed to co-operate, and as a result the book, titled Slade: Feel The Noize!, carried the word ‘OFFICIAL’ on its front cover. I interviewed the band, who’d become friends of mine over the years, and various people associated with their career, including chief roadie Graham Swinnerton, who sadly died in 2015, their PR Keith Altham and even Louise Lea, Jim’s wife, who related the hair-raising saga of a New York bank robbery that occurred while she, Leandra Holder and Jan Hill were queueing for a teller, an episode that foretold Slade’s ill-fated American dream. When I lent my support to the Genesis of Slade CD project, giving my go-ahead to use text from my book in its sleeve notes, I felt the wrath of those who control Slade’s business affairs come down upon me. Although the compilers had cleared the necessary copyrights, the management considered I was out of line and that the CD was ‘unauthorised’. I’m not quite persona no grata – and I’m still on very good terms with two members of the band – but I didn’t help my cause by publishing Don Powell’s book, which didn’t sit well with the same corporate interests, and commissioning for Omnibus Press a further ‘unauthorised’ Slade biography which has yet to be published. I’m confident it will appear before long, even though its original author has been replaced, and in the meantime Ian Edmundson and Chris Selby’s book The Noize will act as a fitting tribute – and a nice companion to my own book – to a band I’ll always remember with enormous affection – that “breath of fresh eayer” that my old pal Chas drummed into me all those years ago. 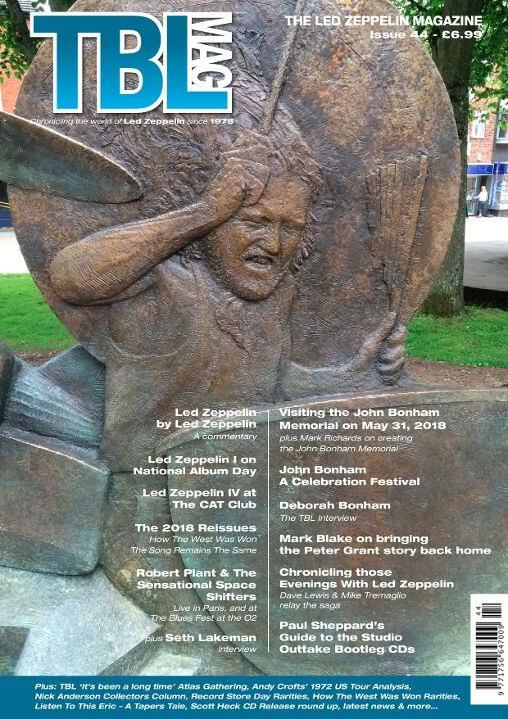 The John Bonham Memorial at Redditch in Worcestershire graces the cover of the latest issue of Tight But Loose, the Led Zeppelin fanzine published and edited by their number one fan Dave Lewis – but you will search in vain for mention of the mighty drummer on the internet pages of Worcestershire County Council devoted to Redditch, or even those of the town’s own Borough Council. We learn that Redditch is the home of the National Needle Museum, a ruined 11th century abbey and medieval moat, and even a bingo hall, but Bonzo – arguably the town’s most famous 20th Century resident – warrants a big zero in the eyes of those charged with promoting the town’s tourist attractions. Shameful, really, especially as nearby Tamworth-in-Arden specifically promotes itself as the village where Nick Drake was raised and died, as does Bromley where David Bowie is nowadays much celebrated and as for Liverpool, well The Beatles are everywhere you look. 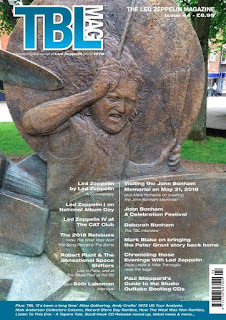 John Bonham takes centre stage in this latest issue of TBL, with a report from Dave on his visit to the memorial on May 31 last year, which would have been Bonzo’s 70th birthday, and interviews with the sculptor Mark Richards, who created the bronze memorial, and Deborah Bonham, John’s sister, who along with several locals fans, was instrumental in getting the project off the ground. Unusually, perhaps, there was no grand launch for the memorial which was put in place rather furtively early last year in the middle of the night. “Doing it all in a subtle manner I think employs some of the Led Zep mystique,” says Deborah. 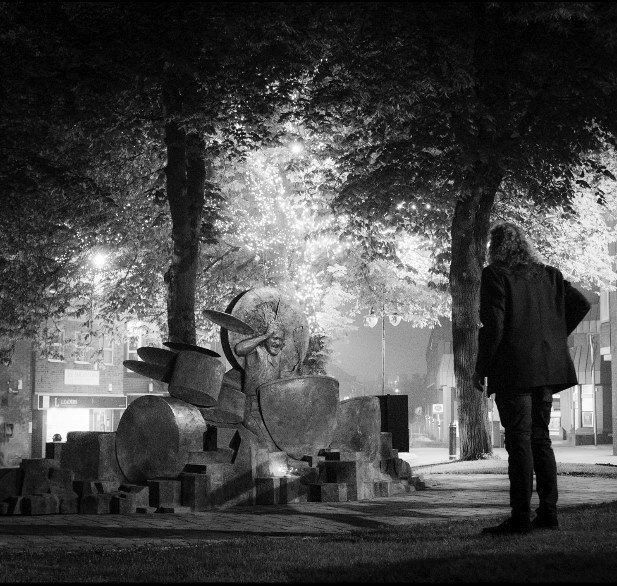 “The fact that the statue appeared in the centre of the town without any real prior warning, for me it had that feel of the obelisk just appearing in all those photos on the Presence sleeve… that ‘here but not here’ sense of drama. I’d like to think our way of presenting the statue mirrored the old Zeppelin mystique.” A bit like the symbols on Led Zep IV and those crop circles on the box set too, I could add. Perhaps that’s why Redditch council seem disinclined to promote the Bonham Memorial. They’re taking the Peter Grant approach. Talking of whom, three pages of this TBL are devoted to an interview with Mark Blake, author of the recent Peter Grant biography, Bring It On Home, that I reviewed on Just Backdated last October (https://justbackdated.blogspot.com/2018/10/bring-it-on-home-peter-grant-led.html). Mark talks about how crucial Grant’s son and daughter, Warren and Helen, were to his research, and how he tried in vain to get some co-operation from Messrs Page, Plant and Jones. “Jimmy Page is a man who likes to have control and he would have not have been able to control what other people said about him,” he adds sagely. Accompanying the fairly frank interview is a screen grab – not used in the book – of Peter in an episode of the BBC comedy Citizen James starring veteran wise-cracker Sid James, that was screened on December 6, 1960. It was a non-speaking part but anyone keen to see what Peter Grant looked like at 25, slim and with hair, is directed to this fascinating shot. Elsewhere there’s a report of a Robert Plant concert in Paris in which six of the 13 songs performed hark back to his old band, Dave waxing lyrical about his book Evenings With Led Zeppelin, which I edited for him, and the usual retrospective analysis of Led Zeppelin shows, tapes, records and bootlegs. 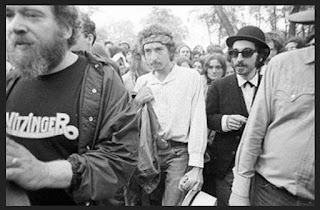 And, as ever, there’s back cover pix of readers from around the world – Berlin, Canton, Naples, Toronto, New York and Cropredy in this issue – pledging their allegiance to what is unquestionably the best informed and most lovingly produced Led Zep fanzine anywhere, or – to the best of my knowledge – on any other band for that matter. As Agatha Christie discovered to her considerable advantage, everybody loves a mystery. The subject of this mystery is Leon Redbone, a musician whom we can safely assume is North American both from his accent and his musical influences. Apart from the fact that he performs with unusual brilliance, little else is known, because Mr Redbone refuses to reveal the slightest shred of biographical information about himself. He has many admirers, not the least of whom is Bob Dylan, but his presence on the American music scene has only been apparent during the past three years. In that time he’s released one album for Warner Brothers (reviewed recently in the MM) and appeared both at folk festivals and in clubs, especially in Canada. Redbone plays ragtime guitar and sings material from the turn of the century, blues, ragtime, melodies of America, with such authenticity that it’s been said that if you listen carefully enough you can hear the surface noise. He also looks the part. Thus the combination produces something much more authentic than mere nostalgia: Redbone actually belongs to another age. Redbone’s repertoire, or at least the repertoire he has so far revealed, consists of songs like ‘The Sheik Of Araby’, ‘Any Old Time’, ‘Big Time Woman’, ‘Champagne Charley’ and ‘Polly-Wolly-Doodle’, all vaudeville-type tunes, as well as some black blues from Chicago and the South. He sings in an extraordinarily deep voice, mumbling the words rather than singing, rolling the phrases out at an alarming rate and often segueing songs together, sometimes linking them with lightning-fast guitar picking that is as accurate as it is precise. Redbone shows a total lack of emotion regardless of how his audience accepts the facade. He has been known to perform a conjuring trick on stage and never acknowledges applause beyond a formal bow of the head. His lack of communication commands respect and the authenticity of his image tends to overshadow the simple fact that much of his charisma is a carefully calculated ruse, which it obviously is. I’ve seen Leon Redbone perform twice, both times at the Bottom Line in New York. After the first show I was quite stunned – stunned enough to want to see him second time. The first time he was opening for Loudon Wainwright III who drew a large crowd, all of whom appreciated Leon immensely. On the second occasion he was opening for Tracy Nelson who drew a smaller crowd that was not quite so in tune with what Redbone was putting across. This time he was accompanied by a solitary tuba player, an ungainly fellow who contributed some pertinent bass lines to Leon’s guitar and vocals. I approached a writer friend with whom I knew he was on speaking terms and, with his introduction, crept backstage to Redbone’s tiny dressing room. He was sat on a chair in the corner, idly picking on his Martin and drinking a Heineken beer. Also present was the tuba player and a lady called Beryl Handler, Leon’s manager and, apparently, his girlfriend. Conversation was stunted, to say the least, but the upshot of the meeting resulted in a vague promise to do an interview in the near future. Leon actually smiled once or twice, twinkling his eyes like Groucho Marx and expressing an interest in Melody Maker’s history which, of course, goes back to the period of his own particular interest. Three weeks later we met again. Leon and his girlfriend were coming into New York – he lives somewhere between NY and Boston – to listen to a performance by Joe Turner, the great stride piano player, who was appearing for a three-month season at the Cookery, a Greenwich Village restaurant. The same writer friend arranged for me to join their party. First we took in a pool hall where, perhaps unsurprisingly, Redbone demonstrated a keen mastery of the cue, and then we moved on to the Cookery, and a table where a good view of Joe Turner’s keyboard technique was available. There was a good half hour to wait, so, with Leon’s defences at their lowest, I attempted an interview, beginning with a question about how long he had been performing. But nobody heard of you until three years ago? Have you always performed the repertoire you are performing now..? Can you tell me how long you’ve been interested in this type of music? But how did your interest hit on this type of material? It’s not something you hear every day on the radio, it’s unusual material. Do you have a huge collection of this type of recorded music to research from? Have you always been a musician? Do you find audiences responsive to your material? Do you think people treat you as a kind of novelty? You look as if you stepped out of a history book. How do you go about finding material, researching it? Records of many of your songs surely aren’t around anymore. Do you have any criterion for choosing material? Are there any writers that you look out for? And black musicians, blues artists? Why do you retain this air of mystery? But you’ve claimed to be several hundred years old. Can you remember your first public performance? Were you happy with your first album? Have you thought about your next record? I’ve heard that Dylan is a fan of yours. Redbone’s interest was waning dramatically at this point, so much so that he appeared to be falling asleep between answers, delaying his replies and becoming more and more reluctant to talk about anything other than the quality of the food or the lacklustre service we received at our table. We left after the Turner’s set, a disappointed Redbone falling in with my suggestion that we have a beer elsewhere. The conversation returned to pool, and half an hour later he caught a cab to Penn Central station to catch a train home. 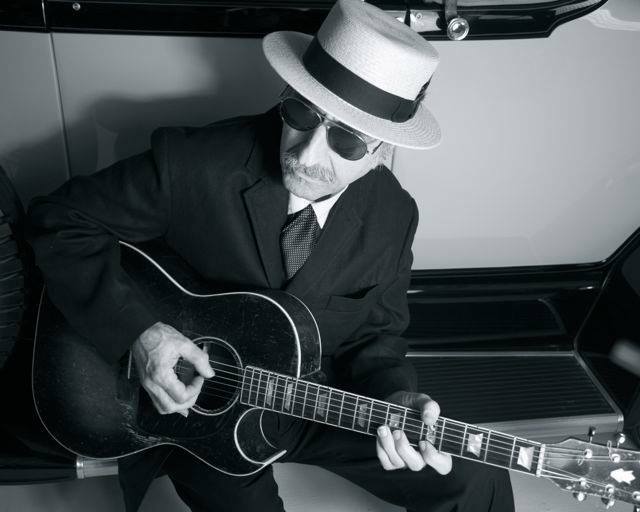 According to his website Leon Redbone retired from music in 2015 due to health problems. Both pictures were downloaded from the same website.